Family Sharing allows up to six members of your family to share purchases from the iTunes Store, App Store, and iBooks Store, along with a family calendar, family reminders list, and family photos. There are some hoops to jump through to set up Family Sharing but it is well worth the effort. 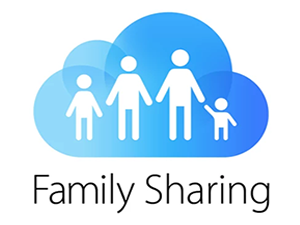 Family Sharing is available on iOS devices (iOS 8 or later), Mac computers (OS X v10.10 or later), and Windows computers with iCloud for Windows (Windows 7 or later required). So if any of your family have older devices running older operating systems, Family Sharing won’t work. Why is Family Sharing an advantage? Let’s say you purchase an app on your iPhone and think it would also be great for your child to use on their iPad. Considering the cost of some apps, wouldn’t it be nice to just share that app with your child versus purchasing a second copy? Family Sharing will let you do this, using a centralized payment system with one credit card used by the entire family. One person is designated as the Family Organizer. The Family Organizer sets up the payment system and configures sharing with other family members. 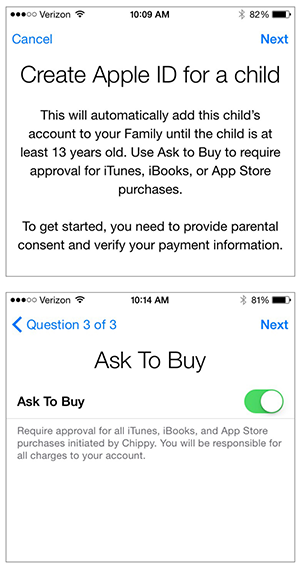 This includes setting up an Apple ID for each kid (children under 13 can’t create their own Apple ID) and, if needed, configuring parental controls on each child’s devices, including the “Ask to Buy” restriction. This allows the Family Organizer to control what can be downloaded on that family member’s devices. It’s easy to manage Family Sharing on a Mac. Just go to the Apple menu and select System Preferences > iCloud > Manage Family. Media (whether apps, music, videos, etc.) need not be shared with every family member. The Family Organizer can prevent certain purchased or downloaded media from being shared with other family members. The organizer simply hides or unhides the item. If hide is selected, the hidden item won’t appear in the lists of purchased items on other devices. Family Sharing lets the Family Organizer create a single shared photo album that’s accessible by every family member. The Family Organizer can create a group calendar to family members can share events with each other. Family Sharing members have the ability to locate shared devices that have Find My Mac, Find My iPhone, Find My iPad, or Find My iPod touch enabled. This feature provides the ability to locate a family member — as long as the device is with them. (The Family Organizer can turn on or off this feature on any device.) Lost Mode can also be turned on for family members’ devices. If you’d like to get started with family sharing, we’d be happy to assist with setup. Please contact us for more information.